On May 16 me started something new on me blog. Like a true Sesame Street Monster me decided to tell you more about the country that me live in through something called the Alphabet. 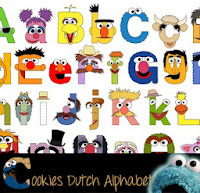 And Cookies Dutch Alphabet was born! Now last week me concluded the Alphabet with, of course, the letter Z. Me like to recap the Alphabet today. Just click on the pictures or the letters and relive your favourite letter. And feel free to drop a note!